On average, in the United States, men earn more per hour when married than when single, even after adjusting for differences such as age and education. However, despite the suggestive evidence that marriage may exert a causal effect on men’s wages, we argue that closer inspection reveals little evidence of such a link. Why might marriage increase men’s wages? A prominent theory, originally advanced by Nobel prize-winning economist Gary Becker argues that couples tend to divide labor, with husbands specializing in paid work and wives in housework and child care. According to this theory, husbands can invest more time and effort in paid employment because they are freed from housework, thereby becoming more productive and earning higher wages. Prior tests of this theory by Hersch and Stratton and Pollmann-Schult, however, suggest that the division of labor within the household is not a satisfactory explanation. For one thing, men’s wages do not suddenly improve following marriage: men’s rapid wage growth begins before the marriage date and before the couple is living together, when it is implausible that men are already benefiting from a household division of labor. Nevertheless, marriage might lead to wage growth for men for other reasons. One possibility is that it exerts a “settling down” effect on men that pays dividends at work. Marriage might also motivate men to seek higher-wage jobs in order to provide financially for their new family. While marriage licenses are signed on a specific day, relationships culminating in marriage typically develop over several years. If marital relationships induce men to behave in ways that increase their wages, unusually rapid increases in men’s wages prior to marriage may indicate that men begin to adjust their behavior in anticipation of marriage. Prior research has thus been ambiguous. On the one hand, the rise in wages prior to marriage may reflect a real effect of anticipating marriage. On the other hand, there may be no causal link between marriage and wage gains; they may both simply tend to occur during the transition to adulthood. People mature at different ages, in their late teens and 20s, and this latent maturation process is associated with changes in a variety of work and family domains as shown in the works of Rindfuss and Shanahan. Because maturation occurs at different ages and paces, individuals will differ in the ages at which they experience rapid wage growth, and they may be especially likely to marry during that same period. 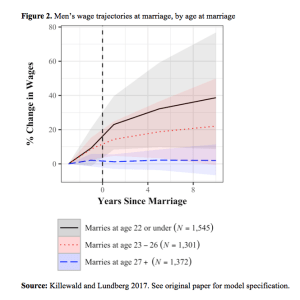 In a recent paper, we provide several new pieces of evidence to suggest that men’s wage growth at the time of marriage is not attributable to causal anticipation of marriage but is instead a spurious association driven by the transition to adulthood. In the figures that follow, we plot men’s pattern of unexpected wage growth – wage growth that we cannot explain with aging and other background characteristics – in the years leading up to and following marriage. First, we divide marriages based on whether they were followed by a birth within 7 months. We refer to those that were as “shotgun marriages” – a reference to the idea that the father of a pregnant daughter confronts her partner with a shotgun and forces him to marry her before the birth. While the image is antiquated, some contemporary couples marry at unexpected times because a child is on the way. 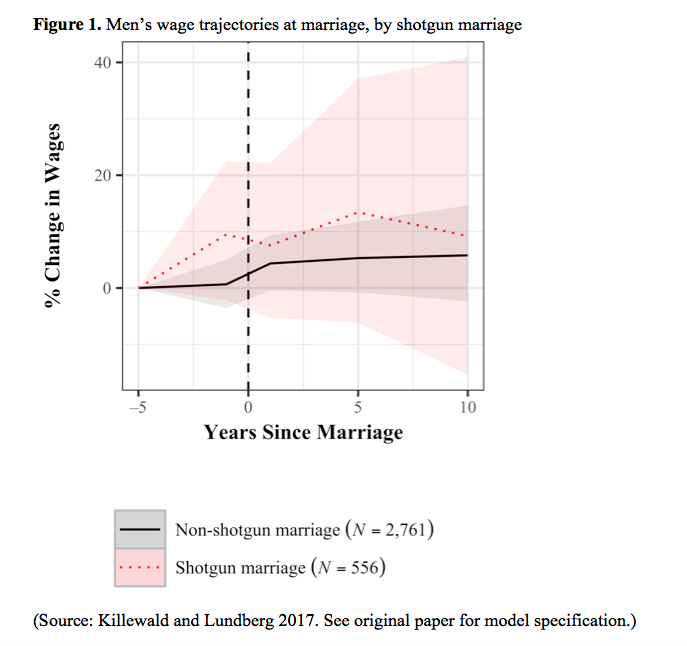 If anticipating marriage causes premarital wage growth, we would expect to see less growth among men entering shotgun marriages, because they were, on average, less anticipated. On the other hand, if marriage and wage growth simply co-occur during the transition to adulthood, then all grooms would be expected to have similar wage growth patterns, regardless of whether the marriage was anticipated. As Figure 1 shows, unexplained premarital wage growth is (if anything) greater among men entering shotgun marriages. This casts doubt on the hypothesis that causal anticipation of marriage drives premarital wage growth and is more consistent with the transition to adulthood perspective. Next, we examined differences in wage patterns at marriage by men’s age at marriage. If the association between marriage and unusually rapid wage growth is due to their co-occurrence in young adulthood, then older grooms should be less likely to experience these wage gains: such gains are more likely to have occurred prior to the years surrounding their marriage. As Figure 2 shows, wages grow unusually rapidly prior to, during, and after marriage only among men who marry at younger ages. At age 27 or older, wage growth in the years surrounding marriage is no different from what we would expect given aging alone. This evidence is most consistent with the argument that marriage and unusual wage growth are spuriously correlated because both are caused by a latent transition to adulthood. Does marriage increase men’s wages? 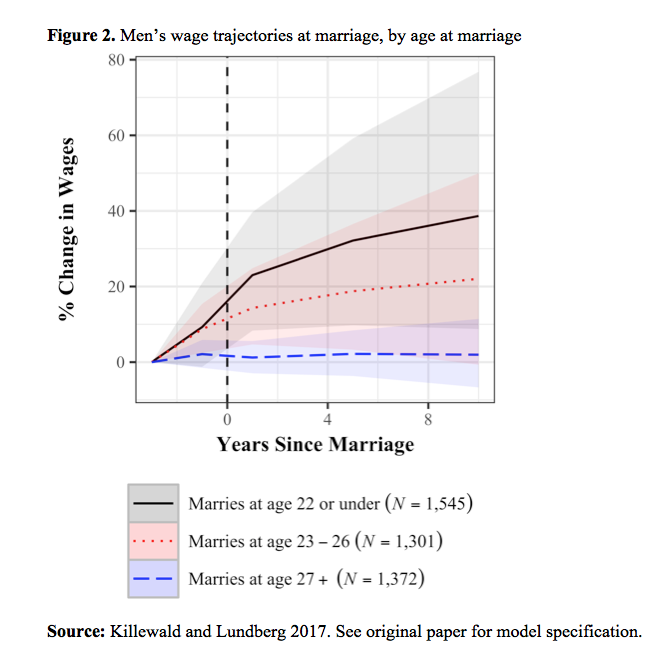 The association between marriage and wage growth is not dependent on marital anticipation (Figure 1) and is greatest among those who marry young (Figure 2). The most concise explanation of these findings is that men’s wages tend to increase around the time of marriage simply because both events tend to happen during the transition to adulthood, not because marriage has any causal effect on wages. Without random assignment of marriage, it is difficult to draw definitive conclusions about the causal effect of marriage on men’s hourly wages. 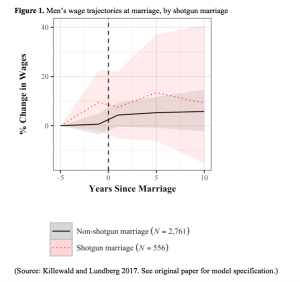 By providing suggestive evidence about how wage trajectories at marriage are moderated by theoretically motivated variables, we have instead argued that the observational associations are generally inconsistent with what one would expect if marriage caused wage growth. In other words, there is little evidence that men’s wages suffer when they stay single. Alexandra Killewald is Professor of Sociology, as well as a faculty member in the Harvard Center for Population and Development Studies at Harvard University. Ian Lundberg is a Ph.D. student in sociology and social policy at Princeton University. This article was originally published on N-IUSSP, the news magazine of the International Union for the Scientific Study of Population. The sooner the man reveals his probably future income trajectory, the sooner he is to find someone interested in marrying him.